Stroke is the 5th most common cause of death in the US, and a leading cause of disability. A stroke occurs when an artery that carries blood to the brain either becomes blocked by a clot, or ruptures. When this happens, the part of the brain that is supplied by this artery cannot get the oxygen it needs. Ischemic stroke - Results from a clot in an artery, which then obstructs the flow of blood to a portion of the brain. Most strokes are this type. Hemorrhagic stroke - Results from a blood vessel bursting, which prevents blood flow to a portion of the brain, and results in pressure on the surrounding brain from the buildup of blood. TIA - Sometimes called a mini stroke, this is actually not considered a true stroke. It can be caused by a clot that resolves quickly. TIA will cause signs of stroke that last for less than 24 hours, then totally resolve back to normal. It is considered a warning sign for a true stroke. What increases the risk for stroke? Age - Risk increases as you get older, particularly over age 60. 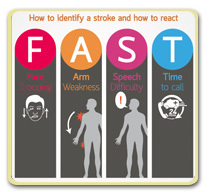 The early signs of stroke are actually easy to identify. There is even an acronym to help you remember them…F.A.S.T. Face drooping. One side of the face droops or is numb. The person's smile will look uneven. Arm weakness. Numbness or weakness of one arm and/or one leg (on the same side). If you ask the person to raise both arms, one arm will drift downward due to weakness. They may be unable to walk due to leg weakness, or may be dragging one leg when walking. Speech difficulty. This can be either trouble actually speaking, or understanding. The person's speech may sound slurred, or difficult to understand. The words may be easily understood, but simply not make sense. If the stroke affects a person's understanding of speech, they may think you are speaking a different language. Time to call 911. Time is brain. Brain tissue is rapidly damaged as a stroke progresses, so the sooner you get help, the better the chances of recovery from a stroke. If you or someone you know shows any of the above symptoms, call 911 immediately. Make sure to note the time the symptoms first appeared (if you know), or the time you last saw the person without symptoms. The list above includes the most common signs of stroke. Here are a few more that you should know. Sudden confusion, trouble understanding things, or trouble doing a routine task. Sudden and severe headache. Sometimes this is described as a thunderclap headache. If you suddenly have the worst headache of your life, this could be the first sign of a stroke. Sudden dizziness, trouble walking, loss of coordination or balance. Sudden change in vision. This can be a complete loss of vision in one eye, or loss of vision in one plane, such as inability to see to your left out of either eye. Some people don't notice loss of vision in one eye right away. Loss of depth perception can be a clue. If you lose depth perception, you should cover one eye at a time, to determine if you can still see out of each eye. Knowing the early signs of stroke can save your life or the life of someone you love. Be prepared, and remember to call 911 immediately. Don't waste precious time. Time is brain! If you have any questions about early signs of stroke, please log into your account and send us your question. We are here to help.